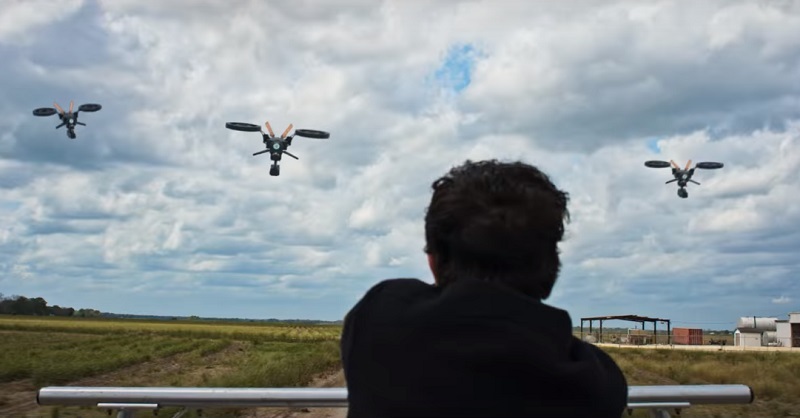 Drones—they’re not just for delivering Amazon packages anymore. They can also kill people Scanners-style. That is what you call a practical application. Unfortunately, a slow, lingering death seems to be a common side effect among farmers who adopted drone technology. When she isn’t killing people, a euthanasia specialist will try to get to the bottom of the mystery in Matt Osterman’s Hover (trailer here), which opens this Friday in New York. Claudia and her partner John are busier than ever dispatching clients in their district. Their latest case work was especially difficult, because she just discovered the boss made her pregnant and he is dealing with the very early stages of a fatal illness. Of course, that gives the conspirators a perfect cover story when they fake his suicide to prevent him blowing the whistle on their arrangement. Somehow the nonprofit and euphemistically named Transitions is in league with the drone company. 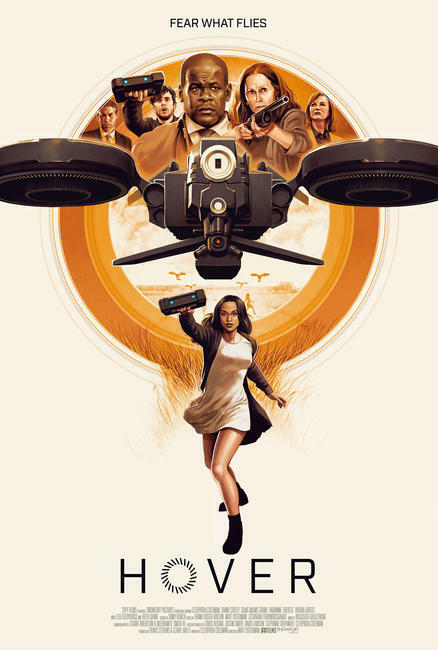 Claudia will start to put the pieces together herself with the help of some rural conspiracy cranks and a dissident maintenance worker at the drone company. Yes, that’s right, Hover combines two super-fun topics: euthanasia and agriculture. Hello! Is anyone still reading this? Arguably, Hover essentially reworks the premise of Michael Crichton’s Runaway, but what was cautionary speculation in 1984 is basically old news in 2018. Still, Osterman invests the film with a moody vibe that mostly works for it, but screenwriter Cleopatra Coleman struggles to carry the film as its weak lead. On the other hand, Craig muMs Grant is worth remembering for future casting thanks to the smart and intense presence he shows as John. Not surprisingly, Beth Grant is convincingly nutty as the tinfoil hat wearing Joanna, while Dré Starks is a real standout as Victor Smith, the paranoid and anti-social son of a Transitions client. Plus, it is fun to see horror movie regular Fabianne Therese appear as Claudia’s duplicitous assistant, Tania. You have to give Osterman and Coleman credit for their thoughtful and complex treatment of euthanasia. This is not an advocacy film by any stretch. It might even damper some viewers’ enthusiasm for the practice. It also avoids most of the dystopian clichés, setting the film in a world nearly indistinguishable from our own. Still, a little bit a future world building would have made the visuals more interesting. The resulting film is well-meaning, but probably already too late. Not very compelling, unless you are a diehard drone-phobe, Hover opens this Friday (6/29) in New York, at the Cinema Village.